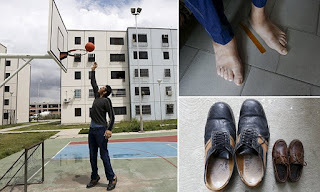 The man with the biggest feet in the world is supplied by new shoes from a German cobbler. Jeison Rodriguez, 22, from Venezeula, has a shoe size 68; for the past five years a shoemaker in the German city of Vreden near the Dutch border has been making his unique shoes for him. Rodriguez’s left foot is 40.55 centimetres long, while his right one is 40.57, making them the largest feet in the world as confirmed on Monday by the Guinness Book of World Records. Rodriguez, from the city of Maracay in north-central Venezuela, left his country for the first time to make his first trip to Georg Wessels, the Vreden cobbler. He said he was very grateful to have been able to travel to Europe and come back with four pairs of shoes. Wessels’ supersize shoe workshop has been providing larger people with shoes for many years.